Anyone who wears glasses or contacts experienced a moment when they went from seeing poorly to seeing well. All of a sudden they didn’t have to sit in front or squint anymore. The same can’t be said about hearing loss, which affects an estimated 1 in 5 college students — as many as 5,000 just at the UO. Project AMP, for Amplify my Professor, is a universitywide effort to improve the accessibility of lectures through the consistent and correct use of microphones in large classrooms. Led by the Communication Disorders and Sciences program at the College of Education, the project reminds professors of their responsibility to students with hearing loss, while advising students about their right to comprehend the information — a critical part of their learning experience. Katelyn Thompson, a 2015 UO graduate, was a Communications Disorders and Sciences major who became hard of hearing as a teenager and transferred to the UO from a community college that did not use amplification equipment in large classrooms. Thompson had never experienced amplification in a lecture until she got to the UO, and she said it reduced her anxiety level so much that her entire body relaxed. She said as much to the professor, lecturer and Undergraduate Program Director Karen McLaughlin, who was inspired to start Project AMP. Most UO classrooms seating 70 or more students have sound equipment available. It consists of a small, wireless transmitter and a lapel microphone that connect to the room’s speakers and are controlled by the same Crestron panel that runs the room’s audiovisual system. These sound systems dramatically reduce background noise, without necessarily raising the overall volume. Sound systems also maintain audio levels when the instructor is turned to the side or fully away from the class, which benefits all students. But professors also benefit; lectures are hard on vocal cords, making it that much more difficult to project toward the end of a week. Amplification gear allows them to use their normal speaking voices. Rhianna Stuck, a junior Communications Disorders and Sciences major, already has benefited from the faculty response to Project AMP, which trickled out late last fall and is endorsed by both the provost’s office and the Accessible Education Center. As part of its outreach efforts, Project AMP has posted placards near the control panel in all large classrooms at the UO. 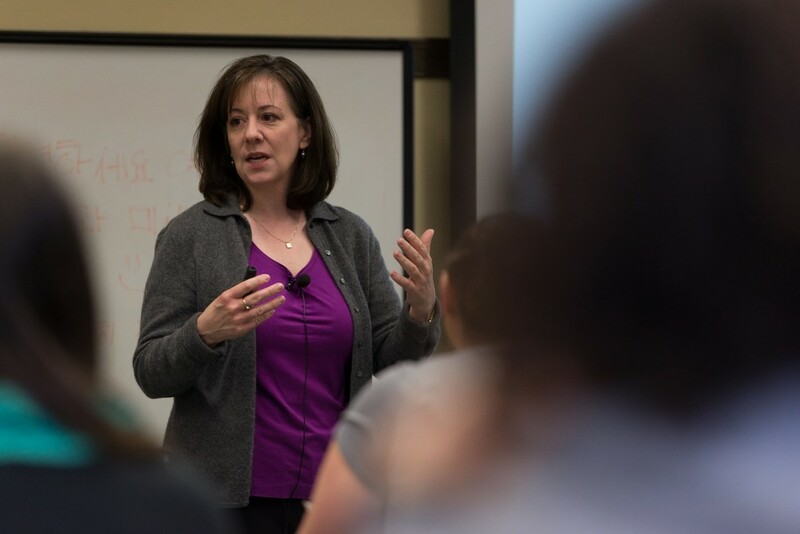 McLaughlin hopes these reminders, coupled with increased awareness about students with hearing loss and the right of all students to hear lectures clearly, will result in better comprehension and more inclusive classrooms.